Hanging out the washing isn’t anyone’s idea of fun, and with the unpredictable winter weather, good luck finding a time to do it. There is nothing worse than having to run downstairs and scramble around quickly trying to get the washing off the line when it’s pelting down with rain, which is a why having a tumble dryer can be extremely handy. Also, drying your clothes in your home on an the radiators or a clothes airers can be a nightmare when it comes to condensation, so a tumble dryer will not only be much quicker and more effective, but it will protect your home from unwanted moisture. There are three main different types of tumble dryer available which include vented, condenser and heat-pump tumble dryers. Vented tumble dryers are the most common type of dryer you can get and subsequently the cheapest. However, with these ones, you’ll need to make sure you have an appropriate space for it so that the vent can be connected through a hose in the wall or window. Condenser dryers work by extracting the moisture from your clothing and then expelling it into a container. These don’t have to be connected to a vent unlike other tumble dryers, which makes it easier to fit it in your home, but you will have to empty the excess water container frequently. Heat pump dryers work in the same way except they, as the name states, have a heat-pump which helps dry the clothes quicker. Although they are a little pricier to buy, they are very energy efficient and can be placed anywhere in the home, which could be easier if you’re limited for space. Most dryers these days have a sensor that can tell when your clothes are dry, so the machine doesn’t run any longer than it needs to. This will save you energy and reduce the risk of items shrinking in the dryer from being blasted with heat for too long. However, manual dryers are still on the market and they rely on you setting the timer for your load, which is not always accurate, but isn’t too much of an extra effort either. 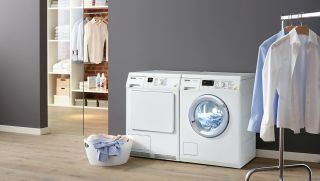 We’ve picked out some of the best tumble dryers on the market to suit all homes and budgets. Be sure to check the load capacity and dimensions to ensure it will fit in the space you need it to! If you have a large family, winter can be tough when it comes to doing the laundry. With this Bosch tumble dryer, you can easily get everyone’s clothes dry in no time at all. It has a large capacity, is super energy efficient and best of all has a self-cleaning condenser so you don’t have to worry about maintenance. Users say that is quick-drying and quiet and most importantly, it doesn’t wrinkle clothes too much so you don’t have to worry about the masses of ironing to do. It is a little expensive, but this is a great investment that will save you time on your chores in the long run and is the best large tumble dryer for families on our list. This Zanussi tumble dryer is incredibly flexible in terms of form, yet a little complex in function. It features an extra-large door for easy loading of your laundry, and a moveable handle to you can choose which direction the door opens. It has a generous load capacity of 8kg which is perfect for a medium-sized household and it aims to put minimal wrinkles into clothes. Users say they are pleased with the results of this machine, but that some of the settings are a little complex or unnecessary for their needs. However, if you currently own a tumble dryer that doesn't have enough settings for your various clothes drying needs, this multi-option machine might just be the perfect upgrade. The concept of the smart home is becoming ever more prevalent and now you can control your tumble dryer with your phone too. With this Samsung tumble dryer, you can control when you do your laundry via an app on your phone. This dryer has regular controls too if you want to operate the machine in the traditional way, but has the added benefit of being able to control it on-the-go. If you have ever switched on your dryer before heading off out for the day, only to return hours later to a slightly musty smelling laundry load, this machine has the answer. Pop your clothes in the dryer before you head out and use your smartphone to turn it on an hour before your return and hey presto, freshly dried garments on your return. Users say that the controls are a little complex, but all-in-all once you know all of the settings, it is really easy to use and quiet when on. This may not be the best looking tumble dryer on the market, but customers who bought this tumble dryer praise it for its simplicity. Its honeycomb drum aims to provide significantly less creasing than other tumble dryers, and it also comes complete with a fragrance kit, which releases scents into the dryer during the cycle, ideal for those who are fussy about smells. There is a popular 'hand iron' function too which aims to almost eradicate the need for ironing at all, the best tumble dryer for busy people. For the eco-warriors out there, this heat pump assisted tumble dryer is a great way to dry laundry all year round while keeping energy costs down. The heat pump recycles air in order to dry your clothes and users find that it is very successful in completely drying laundry unlike some which leave clothes damp. However, be sure to make sure that you don’t place this machine in an outhouse, garage or shed, as they need to be in a warm room for them to work to their full potential. If you’re looking for a budget or entry-level tumble dryer then this might just be what you are after. This machine is big enough for a small to mid-sized household and has a range of different settings suited to different fabrics and clothing from delicates to tougher garments. Its reverse tumble action technology means that clothes don’t get tangled when on a cycle and its easy iron programme aims to reduce the amount of creases in certain fabrics. The best budget tumble dryer on our list that packs a punch with its programs. Many small home owners assume that a tumble dryer is a no-go when it comes to which white goods to pack into a limited space. However, with this compact White Knight tumble dryer, there's a chance you'll actually be able fit a tumble dryer into your pint-sized living area after all. Yes, this dryer is smaller than most standard dryers with only a 3kg capacity, but this makes it a great tumble dryer for couples or anyone who lives alone and dries clothes in small batches. It might not quite fit in your bedding and a weeks worth of clothes, but it'll dry a handful of garments comfortably. Check out our guide to the best vacuum cleaners.